5% Discount On Every E-Commerce Order! 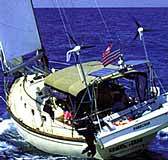 The best selling wind turbine for the sailboat market has been upgraded with a more powerful alternator, new electronics and a more efficient airfoil and is yet again breaking new production records. Used in numerous single handed B.O.C races, the AIR marine wind turbine generator has been installed on several vessels in the upcoming Millennium race. AIR marine wind turbine generator starts producing power at 6 knots and will produce over 400 watts (28 amps) in a 24-knot wind. The new AIR's output is truly impressive. In only ten knots of wind, the turbine will deliver a consistent 2-3 amps and over 8 amps in only 15 knots. Its lightweight and compact design and integrated electronics make it perfect for sailboats of all sizes. AIR marine wind turbine generator's cast aluminum body and corrosion-resistant powder coated finish offer the cruiser the highest possible quality and reliability in wind turbine design. When taking that next extended voyage, you can be assured the AIR marine wind turbine generator will keep your batteries charged. AIR marine wind turbine generator Thousands of satisfied customers now own AIR marine wind turbine generators which has made it the best selling wind turbine of all time. Variable pitch aerolastic carbon matrix blades - Means never having to worry about a runaway wind turbine. Marine quality powder coated aluminum body for maximum corrosion resistance and durability. Auto-brake: Another exclusive feature that automatically slows the AIR to a silent spin when the batteries are charged. Choose the new 400 watt AIR Marine turbine generator to satisfy your power needs. With only two moving parts, the New AIR Marine turbine generator is simple to install, easy to use and requires no maintenance. 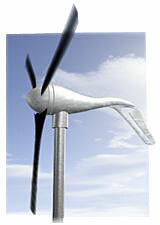 AIR marine wind turbine generator is the number one selling battery charging wind turbine in the world. AIR brings together advanced brush-less alternator technology, state-of the-art carbon composite rotor blades, and exclusive built-in voltage regulation all in an elegant cast aluminum body. Blades: The AIR marine wind turbine generator's blades are made of carbon fiber reinforced composite that twists as the turbine reaches its rated output. This twisting effect changes the shape of the blade, causing it to go into stall mode. This limits the RPM of the alternator, preventing damage in high winds. Alternator: The AIR marine wind turbine generator's alternator is optimized to match as close as possible the energy available in the wind. It is constructed with Neodymium Iron Boron permanent magnets and is brush-less for superior performance and maintenance-free operation. Regulation & Control Electronics: The electronics performs several functions to assure maximum output and safety for the user. The control electronics maintains a load on the alternator at all times to make sure that the turbine never over speeds, regardless of the condition of the battery. As the battery is charged, the sophisticated regulator periodically checks the line, correcting for voltage loss and monitoring charge rate. Once the battery has reached its optimum charge level the regulator shuts the current off preventing the battery from being overcharged, then the blades slow to a silent spin, also preserving bearing life. When the batteries again need charging, the turbines electronics automatically release the brake and allow the amps to flow! AIRMXI-12 AIR Marine Wind Turbine Generator 12 Volt $1072 Add to Cart! AIRMXI-24 AIR Marine Wind Turbine Generator 24 Volt $1072 Add to Cart! TOW-HW-KIT Air Marine Turbine Generator Hardware Kit - $249 Add to Cart! AVO13 Replacement Blades Turbine $156 Add to Cart! Stop Switch / Circuit Breaker 24 Add to Cart! * Please add $24 if you would like Stop switch / 60 amp circuit breaker kit **This interlocked pair of 60 amp circuit breakers protect wind generator to battery wiring and allows you to safely turn off the wind generator for servicing. The AIR Marine Wind Turbine Generator comes with a 3 year warranty.